After dropping Gene off at work Friday morning, I made a quick escape to Connecticut (I blame the midterm craziness!). I tore through the Berkshires in some thick fog, filling up on cheap gas. My first stop in Willimantic was to surprise Perilous Cheryl, but the surprise was on me. I stopped by her office and they told me she was out sick. I was just about to call her when the QoE called me and mentioned that The joey Zone had been sick, too, so I decided maybe I ought to leave them alone and let them rest and recuperate. Instead I decided to annoy Marko at the Punk Rock Jukebox — hee hee! 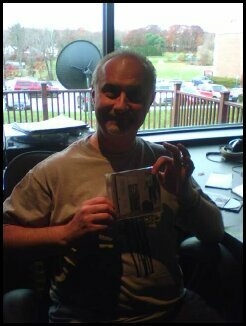 I got to pick the tracks from the Swill of the Day CD (so yes, blame me for “Rhinestone Cowboy”! ), and to make him crack up on the air as well as distracting him so that he didn’t realise there were no songs cued to play next. Always willing to do my part to make things a shambles. The new WECS studio is swanky and huge. As always, I came away with some recommendations on new music to find. The QoE arrived before the end of the show, so we both picked on poor Marko and then headed off to the pub for lunch. 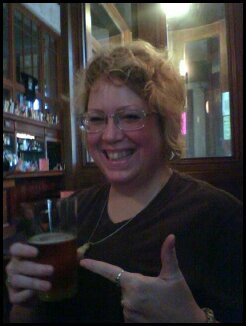 I was pleased to notice they had free (albeit s-l-o-w) wifi at the pub, yee ha! So I got to show off Ianto some more. This was when I discovered my nice new leather bag is so thick that it muffles the ringer on my phone. I didn’t realise that I had missed the calls from Miss Wendy until I got out my phone to take a picture of the Queen (but what a great picture, eh?). Off to Miss Wendy’s next, who took me to services at her temple which were very welcoming and relaxed. They said a kaddish in remembrance of her father Norman, who was a very sweet man. After the service — which also had a young man reading who was becoming a Bar Mitzvah — we shared food and drink, including some really good chocolate chip cookies. Next we were off to the Aloha Alcohula AKA the best damn tiki bar in Connecticut® for some Żubrówka and a variety of cheeses and other snacks. It was a girly night, although one without any nail painting or home perms (we did, however, talk about boys). You can see Wendy’s post for the possum update. We finally made our way back to Wendy’s, where she and I sat up for a bit longer chatting, finally going to bed sometime after 3, so no surprise we slept late Saturday and then watched movies. All in all a very relaxing trip and much fun. There’s always time to steal a little vacation even in the middle of the semester. Hee hee — you are a better woman than I am. Shudder — on the best of days you could not talk me into spending a Saturday morning with a theater full of small children, especially to watch a sequel to a lame film.Yes, it’s fun to see Marko’s vein pulsing in time with the music!You glow fabulously in the photo. Aren’t you glad I deleted the other two [evil grin]?